Not being bound by time and place, what does Allah mean when He says “Indeed I am truly close”? What is the reality of closeness? How does it affect the believer? What effect does this have one’s understanding and practice of religion? Join us in this course in which Shaykh Faraz Rabbani draws on the words of the wise to dispell any misconceptions about Allah’s closeness, and to show the closest way of imbuing one’s practice with this understanding. Whether you’re alone in a car, in the middle of a crowd, throughout the day, as the sun sets, and in the solitary depths of night, Allah is always close. Realizing this can bring much-needed solace in the darkest hours of need, and it can bring new to life the celebrations of His favors. Knowing that Allah is close, listening when one calls on Him, is what fills a believer with hope, courage, strength, patience, longing, and love. Facing any challenge is made much easier knowing that He is with you. In fact, a constant awareness of Him is the very perfection of faith according to the Messenger of Allah, Allah bless him and give him peace. 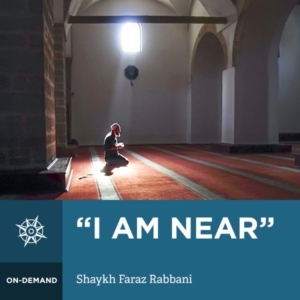 In this course, Shaykh Faraz Rabbani guides us through the concept of Allah’s closeness, and how it can be used to enrich one’s practice of the religion and one’s relationship with Him. Drawing on Qurʾanic verses, prophetic hadiths, and the aphorisms of some of the greatest saints of the Muslims – such as Shaykh Ahmad ibn Ataʾillah al-Sakandari, and Shaykh Shuʿayb Abu Madyan – it aims to furnish us with the means of realizing what Allah’s closeness means.